When I was pregnant with Eleanor, I spent a fair amount of time on Pinterest adding to my boards all things “baby”. One thing I saw pop up on Pinterest, as well as through different friends, was the idea of taking the same photo each month to document Eleanor’s growth. I saw so many ways of doing it, and I felt inspired to find our own creative little way. 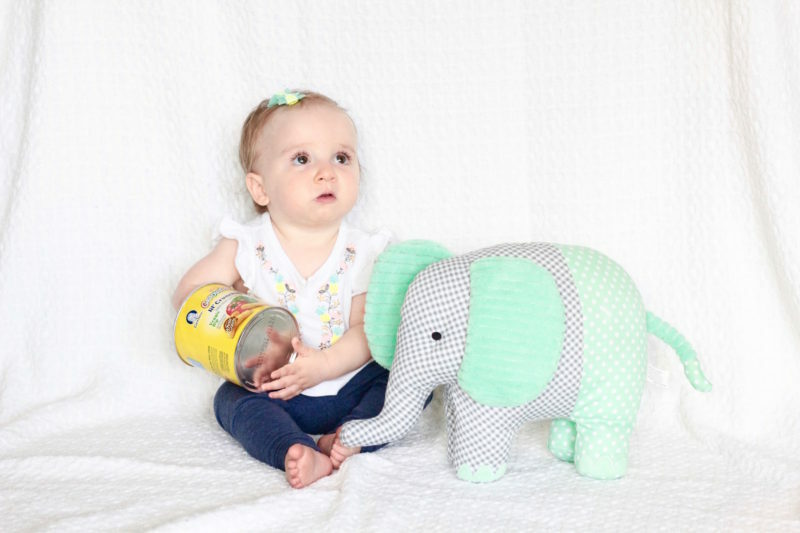 I took 12 photos of her first 12 months, each with her beside the elephant. It’s so crazy to see the difference as she grew. You can tell when she starts to get mobile because she’s no longer happy to be sitting still with her elephant! It was much harder at that point, all the way to the last photo, which has food in it to keep her sitting still. Moving forward, I don’t know how much of all of this I will do with subsequent children, but I do know that I really enjoyed these monthly photos and hope to at least do this.